Last Thursday, drum corps fans came out en masse to Drum Corps International's spring cinema event, The Countdown. 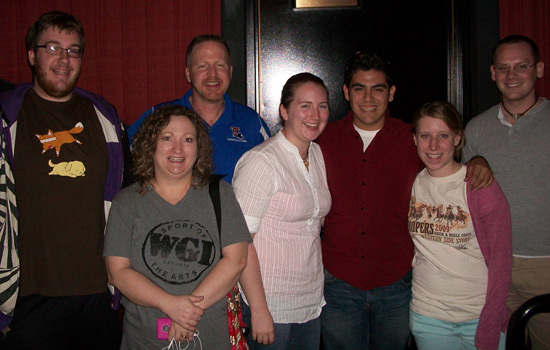 Anticipating the start of the 2010 DCI Summer Tour, these fans had the opportunity to catch the program up on the big screen in more than 480 theaters nationwide. I'm an assistant band director from the Rio Grande Valley at PSJA Memorial High School from Alamo, Texas. 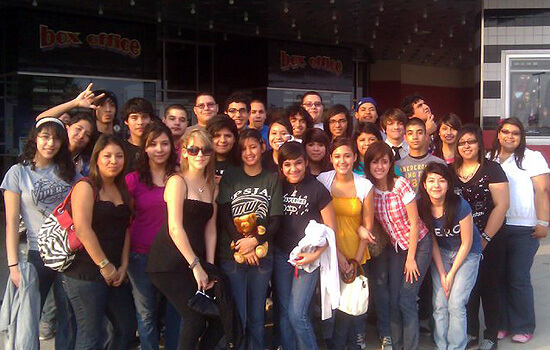 We showed up on May 13 with about 35 students to watch the Countdown in McAllen, Texas. The kids had an awesome time and did gain some knowledge from watching the shows. It also pumped them up to attend the summer show in San Antonio! They can't wait to see what else is in store for them! I made these cupcakes in honor of the top five shows being shown at the Countdown. It features the logos of the Blue Devils, Carolina Crown, the Cadets, the Cavaliers and Santa Clara Vanguard, all drawn in frosting. I'm not a pastry baker, nor an artist, so they don't look perfect. 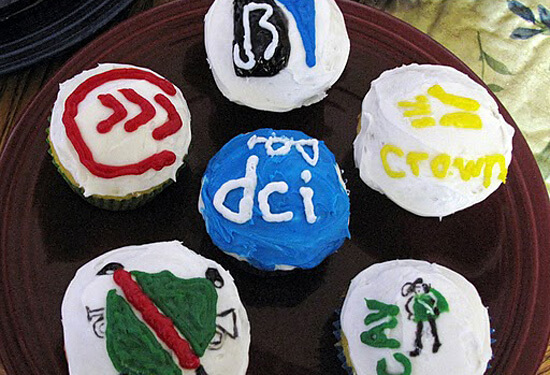 The white scribble on the DCI cupcake is supposed to be a horn, and I didn't have quite enough room to finish "Cavies," so that's why it says "Cav" on that cupcake! Submitted by Ben V. This is Ben V. and Oscar O. from El Paso, Texas. We were all hyped-up for the Countdown! 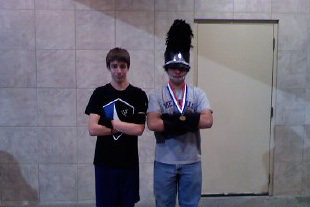 Oscar wore his apparel from the 2009 Memphis Sound, and I wore a Blue Knights get-up. After the show, we jazz ran a few laps and posed for this majestic photograph. Box 5! The DCI Countdown from Mansfield, Texas. Becca S. (Troopers), Gerado C. (Troopers), Elizabeth H. (Pioneer & Boston Crusaders), Alan C. (Cavaliers), Marcus M. (Troopers), Hugh & Bobbie H. (Pioneer). 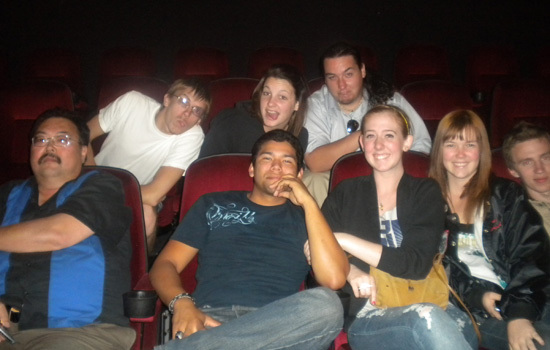 This is a fraction of our group who attended The Countdown at the Irvine Spectrum. We we're all brought together by the Velvet Knights, some alumni, and some friends. Now that we're all marching in different corps; Mandarins, Pacific Crest, The Academy, and BD Alumni '09, we are still brought together by Classic Drum Corps. 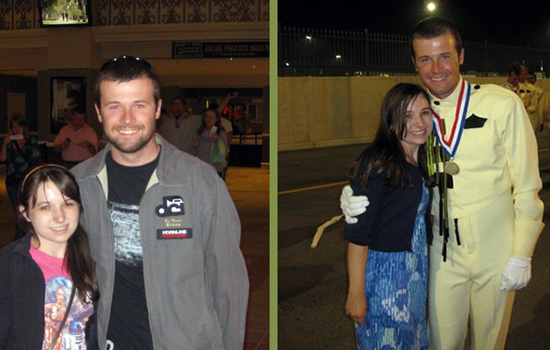 These are photos of my girlfriend and me from last season's World Championship Finals and The Countdown. This was my third and final season with Crown ('06, '08, '09). It is awesome seeing how the hard work really pays off in the end. Not only being able to watch an amazing production on the big screen or DVD, but also being able to see the people who have really missed you during summer is always something to look forward to during those long days on tour.